Latest patch can be found here. Select the version more suitable to your version. Delete or rename attract_english_ntsc.vp6, ea_bumper_english_ntsc.vp6, eahd_bumper_english_ntsc.vp6 and psa_nikki_english_ntsc.vp6. If you have another language then the delete the file with your language instead and if you have the PAL version the files will have PAL instead of NTSC in the end. Change SkipIntro = 0 to SkipIntro = 1. Change WindowedMode = 0 to WindowedMode = 1. ThirteenAG's fix may require the latest patch. See Patches. Use ThirteenAG's fix and NFSC HUD Adapter. Limited to an 'Anisotropic' option. Extract the contents and open the application. Click on File → Open and select the installation folder. On the left side, expand camerainfo and default. On the right side, expand FOV and change the value beside  to the FOV you want. For the hood camera, you may have to change the value for each car individually. Click on File → Save to apply the changes. Menu buttons and look back (when racing, always L) cannot be rebound. Use ThirteenAG's fix for proper menu navigation. Use ThirteenAG's fix to set Xbox/DualShock prompts. DirectInput controllers only. For XInput controllers, see here. 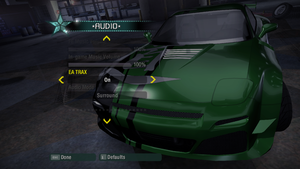 Sound Effects, Car, Speech, Menu Music and In-Game Music sliders available. Limited to a 'Surround' option. Up to 5.1 output. Though the game not uses EAX, Creative Alchemy still can be used to enhance sound quality. It will just emulate DirectSound and 3D positional audio with OpenAL. Difference can be easily noticeable when music is off. For non-Creative cards users see here or use dsoal. Run in Windows XP SP3 compatibility mode to avoid crashing career mode while using Alchemy/dsoal. Sometimes whole career need to be started from the beginning with compatibility mode and Alchemy enabled. The solutions are to avoid disapearing car in career menu and crash after attempt to race. Compatibility mode can cause resetting of the game settings. Please note that attempt of changing details in the game (renderer reset after returning from video settings), and either alt tabbing, have an influence on audio quality, also giving diffreent results depending on g_AudioMode setting to 0, 1 (default) or 2  in registry. Change ShowSubs = 0 to ShowSubs = 1. Currently unplayable without a mod called "Online Enabler". Windows 8/8.1/10 removes important DirectX components, causing game to run poorly, and possibly lead to multiple crashes. These components can be brought back by installing DirectPlay. More about DirectPlay here. Deadzone can be adjusted in NFSCarbon.WidescreenFix.ini. Make sure CrashFix = 1 is set in NFSCExtraOptionsSettings.ini. Set WindowedMode = 1 to run the game borderless windowed. Set WriteSettingsToFile = 1 to store the game settings in the Settings.ini file. Check your audio settings afterwards, they can be messed up. eauninstall.exe error: "The program can't start because EAInstall.dll is missing from your computer. Try reinstalling the program to fix this problem." This makes everything in the game smoother, such as the drift force being applied much smoother to the car. Extract dinput8.dll to the installation folder. Download NFSC Physics Framerate Changer. Extract the contents to <path-to-game>\scripts\ (create if necessary). Open SpeedCarbonPhys.ini and change PhysicsHZ = 120 to the desired value. Change AlwaysRain = 0 to AlwaysRain = 1. Add RainDropletsScale = 0.5 and change the value if needed. Download Xbox Rain Droplets and put the asi file in scripts folder. NFSC Extra Options - adds various new settings and fixes vanilla game bugs. NFSC Fog Options - This mod gives you full control over the CG fog settings. NFSC Wingman - This mod brings you some new crew stuff. NFSC Enhanced Visual Treatment - enables an unused graphics option and other tweaks. World Filters & Sky for Carbon - This mod ports Visual Treatment filters and Sky Shaders from World to Carbon. 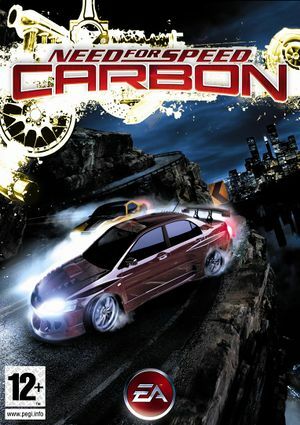 Need for Speed Carbon HD Edition - includes high resolution textures.